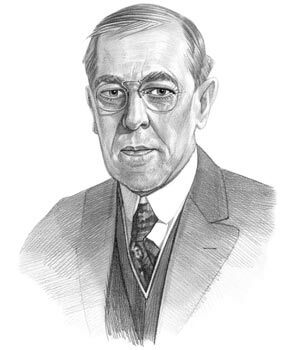 Woodrow Wilson was the 28th President of the United States who served in office from March 4, 1913 to March 4, 1921. What was the life of Woodrow Wilson like? The short biography of President Woodrow Wilson covers important information and facts about his early life, his family, career and the famous events and achievements of his political life. Our short biography of Woodrow Wilson provides an interesting and easy way to learn about the life of the President. The following important facts provide a fast overview of important facts about President Woodrow Wilson. Facts and Info: Woodrow Wilson was the 28th president of America who led the US into World War I in 1917 and also drafted the peace plan at the end of it. During his term in office women received the right to vote with the passing of the 19th Amendment to the Constitution. For additional info refer to 20 Facts about Woodrow Wilson. Facts and Info: Woodrow Wilson was born on December 28, 1856 in Staunton, Virginia. Wilson's father was a Presbyterian minister. Woodrow Wilson had an illustrious education and career. He was elected president of Princeton University in 1902 and became President of the US in 1913. He won the Nobel Peace Prize in 1920 and died on February 3, 1924 in Washington D.C.
Facts and Info: The career of Woodrow Wilson included the roles of professor, college administrator, politician and statesman. He became the 28th President of America in 1913 and served for 8 years until 1921. He was the first president to hold a press conference. Facts and Info: Woodrow Wilson married his first wife Ellen Louise Axson on June 24, 1885. He married his second wife, Edith Bolling Galt, on December 18, 1915. Edith was a distant relative of Pocahontas. Edith was his connection with the outside world after he suffered a stroke which paralyzed his left side and became one of the most powerful first ladies. Woodrow Wilson had 3 children. Their names were Margaret, Jesse and Eleanor. Facts and Info: Woodrow Wilson belonged to the Democrat Political Party. He was 56 years old when he was inaugurated as the 28th president. Thomas Riley Marshall stood as the Vice President. Woodrow Wilson was the first president with a Ph.D. For additional facts refer to his Presidential Cabinet members. Short Biography of Woodrow Wilson: What he was like! Facts and Info: Woodrow Wilson was 5 feet 11 inches tall and weighed approximately 175-180 pounds. He had a long, thin face, large ears, brown hair, grey-blue eyes, a sallow complexion and bad teeth. Woodrow Wilson had a flock of sheep that grazed on the lawn of the White House. Their wool was used to raise money for the Red Cross during World War I. His nickname was “Schoolmaster in Politics”. Facts and Info: During his lifetime Woodrow Wilson played a key role in important events of the era including World War 1. World War 1 was triggered on 28 June 1914 by the assassination of the Archduke Franz Ferdinand of Austria. On May 7, 1915 the Lusitania, a cruise ship, which had many American passengers aboard, was sunk by a German U-Boat. For this, together with economic and political reasons the USA declared war on Germany on April 6, 1917. The passing of the 19th Amendment that gave women the right to vote. Facts and Info: During his life Woodrow Wilson suffered from various health problems including eye twitches, hypertension and multiple strokes. Facts and Info: Woodrow Wilson died of paralysis caused by a stroke on February 3, 1924 in Washington D.C. He was buried in the Washington National Cathedral. Wilson is the first president to be buried in Washington and the first President to be buried inside a church. The short biography of Woodrow Wilson provides a fast overview of the key facts and events about his life and the accomplishments of his presidential term in office. The following Woodrow Wilson video enables you to sit back and listen to the history of his personal and political life - a useful educational resource for kids, children and schools learning about the life of President Woodrow Wilson.